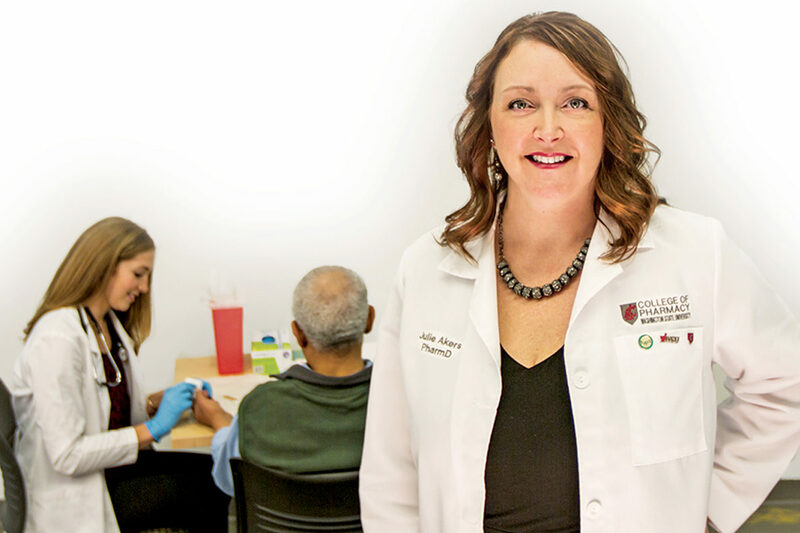 The American Pharmacists Association (APhA) announced that Washington State University’s Julie Akers will receive a profession‑wide award during its annual meeting, March 23–24 at the Washington State Convention Center in Seattle. Akers demonstrates this excitement in her role as the Washington State Pharmacy Associate (WSPA) faculty advisor. Akers works with WSPA student leadership to educate student pharmacists on state level heath care legislation. As part of this effort, she helps organize an annual Legislative Day. During the event each spring, over 100 student pharmacists travel to Olympia to meet with members of the state legislature to discuss current bills and advocate for the practice of pharmacy. Akers has also served on the Washington State Pharmacy Association (WSPA) Board of Directors for over ten years and served as president of the association in 2012. She serves on the American Pharmacists Association (APhA) government affairs committee, and has represented the State of Washington as an APhA delegate for several years. For the past 3 years, Akers has represented the college at the state Pharmacy Quality Assurance Commission meetings where she works to advance the role of pharmacists in Washington through both the legislative and rule‑making process.